Starting in Pre-K and continuing through 5th grade, we dedicate much of our class time to building language skills naturally and authentically through singing songs, reading stories, making art, conversation, and, of course, playing games. Don’t be surprised if your child comes home singing a counting song or tries to teach you a dance about the days of the week in Spanish! As kids progress to the upper grades they take on more writing in Spanish and begin to learn some basic grammar fundamentals of the language. Recently, several classes embarked on more involved thematic projects that are stretching their language abilities and learning opportunities in new ways. 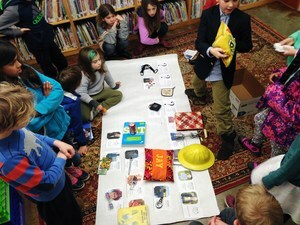 Project themes kids are working on include friends and clothing, family traits, and friendships with lower school buddies. Valley fifth graders are looking forward to sharing stories they are writing in Spanish with their buddies. Third and Fourth graders are investigating family backgrounds and plan to share their “Mi Familia” projects with families. Fourth grade will share on January 30 from 3:15-3:30 p.m. and third grade will share on February 1 from 3:15-3:30 p.m.
Be sure to connect with your students about what they are learning in Spanish. Adiós!